Apple on Monday rolled out a security update for OS X, as well as separate updates for iOS and Apple TV, that addresses a number of recently discovered vulnerabilities, including a widely publicized SSL/TSL flaw dubbed "FREAK" that could in some cases allow malicious users to intercept secure communications. Highlighted in a report last week, "FREAK," or "Factoring RSA Export Keys," is a flaw recently discovered in certain embodiments of cryptographic protocols SSL and TLS. 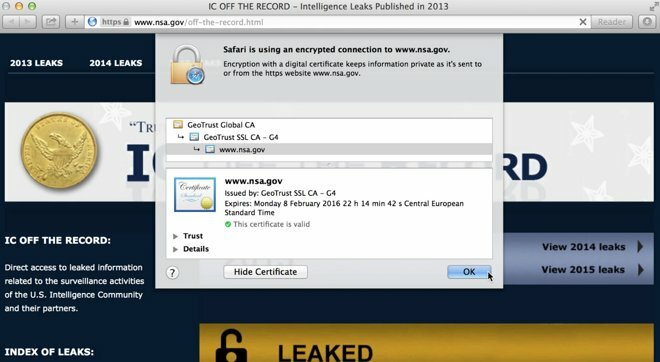 Since Apple's Safari, as well as other Web browsers, rely on these secure connections to transfer data, FREAK leaves systems open to so-called man-in-the-middle attacks that force clients to use a weaker form of encryption than requested during communication sessions. According to Apple, the flaw only affected connections to servers that run certain RSA cipher suites. To rectify the issue, Apple removed support for ephemeral RSA keys, the basis of the vulnerability. According to Apple's dedicated security updates webpage, FREAK affected not only OS X, but iOS and Apple TV as well. Apple addressed the issue with iOS 8.2 earlier today, while the most recent Apple TV 7.1 update takes care of Apple's set-top streamer. Alongside the FREAK patch are fixes that affect iCloud Keychain, IOAcceleratorFamily, IOSurface and OS X Kernel Apple said. Apple's latest OS X Security Update 2015-002 can be downloaded and installed via Software Update. No one here has the answer to that. Apple does not reveal their software release schedule. Presumably, the fix will be included shortly in a future release. Users of beta software should be aware that what they are voluntarily running may not be up to production software standards, including security. If you are running a beta operating system, you should be doing so on a secondary machine or an accessory boot drive/partition. Nothing showing up on any of my 10.10.3 beta machines. Maybe already fixed? Don't use it to send classified information for now. I'm not at home at the moment to check my AppleTV 2 but did it receive an update as well? As of last night it hadn't. I just checked and it still says I'm up to date but it could have updated automatically. I didn't pay attention to the versions yesterday but as of this morning it says I have OS 7.1.2 and Apple TV Software Version 6.2.1 (click select on the about screen to toggle the OS/ATV Software versions - not sure why they couldn't just put them on their own lines). Then use Firefox. I don't believe it is susceptable to a FREAK attack. AppleCare told me to use the 'feedback' link instead, which I've done.